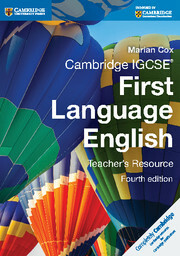 Up-to-date resources providing full coverage of Cambridge IGCSE® First Language English (0500 and 0522) for first examination in 2015. 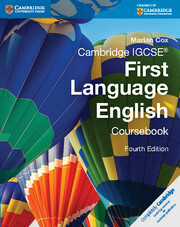 Cambridge IGCSE First Language English Coursebook (fourth edition) is designed to support the Cambridge IGCSE First Language English (0500) and Cambridge International Level 1 / Level 2 Certificate First Language English (0522).A student-friendly resource Cambridge IGCSE First Language English Coursebook (fourth edition) teaches the reading and writing techniques required for the Cambridge IGCSE, as well as providing two bespoke units on speaking and listening techniques, plus embedded activities on these skills throughout. It includes carefully designed activities on a variety of engaging topics, set out in 14 lively, full-colour units. A dedicated microsite for Cambridge First Language English provides free online resources to support the course, including answers to the Coursebook activities. Fully matches the new syllabus whilst still including the successful topic-based approach to learning. Progression of skills development through imaginative activities. 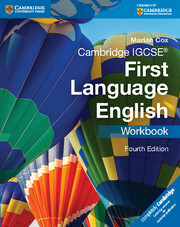 Contains four themed sections selected for their relevance to students worldwide. Each unit of the coursebook focuses on a different component of the course: reading, directed writing, composition or speaking and listening. All units cover the learning objectives for that component, building up through the unit so skills are gradually developed. Reading passages have been fully updated to include new international texts and a global approach to learning. Language accessible to students of a wide range of abilities. Provides clear, practical support for students. Task tips and Further practice boxes help students build confidence and develop the skills needed to fulfil their potential.